Phone Camera Flash Blinded this Little Baby. To all those who love snapping little babies with all kinds of phones with heavy camera flash, please take note before you land yourself in trouble. 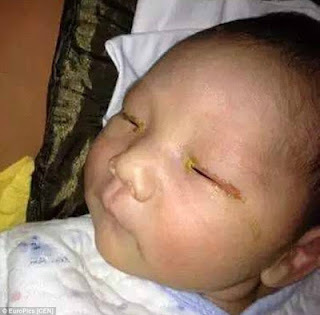 The baby pictured above was left blinded in one eye after a family friend forgot to turn off his camera flash while taking a close-up photograph of the baby boy. Doctors said the three-month-old baby, who has not been named, has suffered irreparable damage from the flash of the camera, which was held about 10 inches away from the baby boy. Soon after the pic was taken, the parents noticed that something was wrong with their baby’s vision. According to Daily Mail, following the incident, the baby suffered from reduced vision in his left eye and blindness in his right eye. The damage is said to be permanent and cannot be fixed with surgery. The flash has damaged cells on the macula, the part of the eye where incoming light rays are focused. Doctors also say parents should be careful of strong bathroom lights when their babies are taking a bath. It is not clear whether the family friend will face any legal action following the incident.